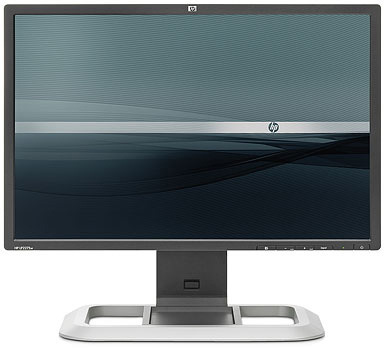 The HP LP2275W looks very much like its 24" brother. The bezel is thin all the way round the panel, and is finished in an attractive matte black colour. There is a small unobtrusive HP logo in the middle of the top bezel, and the model name is written in the bottom left hand corner. The OSD operational buttons are situated in the bottom right hand corner, and sit flush in against the form of the bezel. They are not distracting during normal use. The same cannot be said for the overly bright green LED which lights up during use. Thankfully this can be turned off via the OSD if you want. In standby it glows a more subtle orange colour. Overall the screen looks profressional and well built, the base is perhaps a little big and chunky, but at least it is sturdy. The screen features a nice range of ergonomic adjustments. The full range of the tilt is shown above, and the stand is also height adjustable (shown at max height below) and offers a pivot and rotate function as well (also shown below). This range of adjustments is excellent, and movement is fluid and sturdy. Overall the build quality and materials feel good. However, there are a couple of minor issues with build quality that I have at this stage. The screen gives off a faint, but audible, buzzing noise when in use. When you switch between inputs via the OSD, you can even hear it buzzing a little louder as it searches for an input signal. I'm not sure if this will be apparent on all units, but I could detect the buzzing from my review sample. Secondly, the screen has one of the fussiest DVI interfaces I have ever used! Normally when reviewing new screens, it is easy enough to plug and play, and Windows will detect the new screen and allow me to alter to whatever the native resolution should be. For some reason, it was a little tricky getting the display to detect the DVI input at all when I first connected it, and I had to have a play around and swap DVI cables, turn it off on and on several times etc. When I got it to display something, I then had some trouble getting the display to work at the native 1680 x 1050 resolution. In the end, I had to install the driver from the provided software CD, and then reboot my PC. If you have any such issues, I'd recommend this course of action. Perhaps the screen and interface chip are just a little fussy. There were some occasional issues with the screen detecting an input when being turned off and on, unplugging the DVI cable and reconnecting seemed to correct it, but this was a niggly issue. The range of adjustments from the LP2275W was impressive, and certainly nice to see a company investing in this, while still trying to keep the overall cost of the screen down. Dell do a similar thing with some of their UltraSharp monitors, and the adjustments felt very similar to some of their offerings. The OSD was easy enough to navigate, and featured a wide range of options. The OSD buttons shown below allowed quick access to menu (left), auto config (analogue inputs), factory reset (not sure why you'd need quick access to that?!) and input select (between DVI and DisplayPort). As well as the usual options for brightness, contrast etc, the screen featured colour preset modes for 9300k, 6500k, sRGB and 'custom colour' (full RGB access). There were hardware level options for aspect ratio control, offering "fill to screen", "fill to aspect ratio" and "one to one". The OSD was easy to control and comprehensive in options. No issues here. Accessing the factory menu confirmed the LP2275W was using Samsung's LTM220M3 S-PVA panel. The back of the screen featured interface options for DisplayPort and DVI. There was oddly no VGA / D-sub interface, which is a shame if you want to connect two machines, or some external devices, to the monitor. Not sure why HP would have left this off. They have provided a VGA > DVI cable with the monitor for those who don't have a DVI enabled graphics card, but with only one (mainstream) interface, the HP felt a little limited. This was in contrast to the 24" LP2475W which featured a wealth of interface options, but admitedly lacked D-sub there as well. Presumably cutting back on these here has helped keep the cost down a little, allowing them to compete with the extensive TN Film population of the 22" market. The screen also features an integrated 4 port USB 2.0 hub, with two ports on the back (as shown above), and two on the side (visable in some of the other images). The HP LP2275W utilises an 8-bit S-PVA panel, capable of producing a true 16.7 million colours. The screen uses enhanced W-CCFL backlighting and so it's colour gamut covers 92% of the NTSC colour space. An important thing to consider for most users is how a screen will perform out of the box and with some basic manual adjustments. Since most users won't have access to hardware colorimeter tools, it is important to understand how the screen is going to perform in terms of colour accuracy for the average user. I restored my graphics card to default settings and set it to its standard profile. The LP2275W was tested at default factory settings out of the box using the LaCie Blue Eye Pro and their accompanying software suite. At default settings, the screen was actually fairly pleasing to the eye. Colours felt even and vivid, but perhaps a little too 'neon' in greens and reds. There was also a slight tendency towards green, with a slight yellowy-green tinge to white backgrounds. Luminance was actually quite reasonable, and not as overly bright as we have seen with other screens such as the larger 24" LP2475W model. Nevertheless, brightness control was set at 90% at default, and if nothing else, you will probably want to turn this down to around 50 - 70, depending on your ambient lighting conditions. Testing with the colorimeter revealed quite a pleasing result. Luminance was a high at 210 cd/m2, but certainly not as high as the 357 cd/m2 we saw from the LP2475W at default settings. It was considerably out from the desired 120 cd/m2, which is the recommended luminance for LCD screens in normal lighting conditions. However, even with the high default luminance, the screen rendered a nice deep black at around 0.20 cd/m2, in turn giving us an excellent static contrast ratio of 1054:1. This was even slightly higher than the specified 1000:1 maximum contrast ratio by HP, and was a very good result owing to the use of the Samsung S-PVA panel. The 6500k colour preset mode which was operational out of the box proved very accurate, with actual colour temperature being recorded at 6274k, only 3% out from the desired value which is the temperature of daylight. Gamma was recorded at 2.3, again pretty close (5%) to the desired 2.2 being the default for computer monitors, the Windows operating system and sRGB colour space. You can tell from the CIE diagram on the top left that the triangle representing the monitor (black) stretches considerably outside of the reference sRGB space (orange). This proves the screen is using extended wide gamut backlighting, and covers about 92% of the NTSC gamut. As you can see from the above results, the control of the screens luminance via the OSD menu was very good. 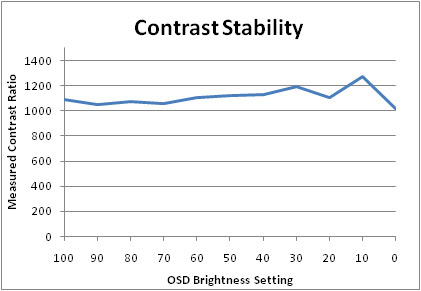 The default 90% OSD setting gave a luminance value of around 210 cd/m2 as we have discussed already. As you lower the brightness control in the menu, the voltage sent to the CCFL backlighting is reduced, and therefore the backlight intensity is reduced as well. The luminance ranges down to a very low 41 cd/m2 when brightness is set to 0%. 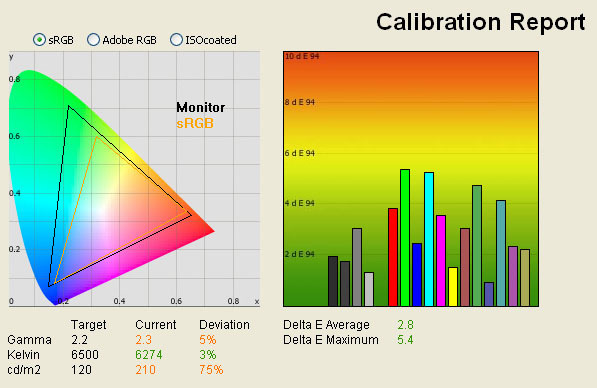 Even if proper calibration is not possible, you can get a comfortable luminance of the screen at around 50% brightness setting, which is re-assuring. The maximum luminance of the screen, with brightness at 100%, was only 239 cd/m2, which was a little off the maximum brightness specified for the screen of 300 cd/m2. While brightness is reduced, the black depth improves quite nicely as well, reaching a incredibly impressive 0.04 cd/m2 at 0% brightness. This is very respectable for any LCD panel, and is owing to the use of S-PVA technology, and the best black depth we have recorded on such technology so far in our reviews. During these brightness changes, the contrast remains pretty static and within the range of 1054:1 to 1274:1. Interestingly, the worst contrast ratio was recorded with the screen at default settings (1054:1), again giving reason to adjust the brightness control down to around 50%. The screen offered very good performance in this regard, showing that with proper backlight adjustments you can achieve not only comfortable settings for every day use, but retain a decent contrast and black point throughout the range. The results were plotted on the above graph, showing the contrast stability of the screen. You can adjust the brightness setting to anywhere within the 0 - 100% range without really impacting contrast ratio. As you reduce the brightness setting, luminance is adjusted nicely, and black depth improves as one would hope. 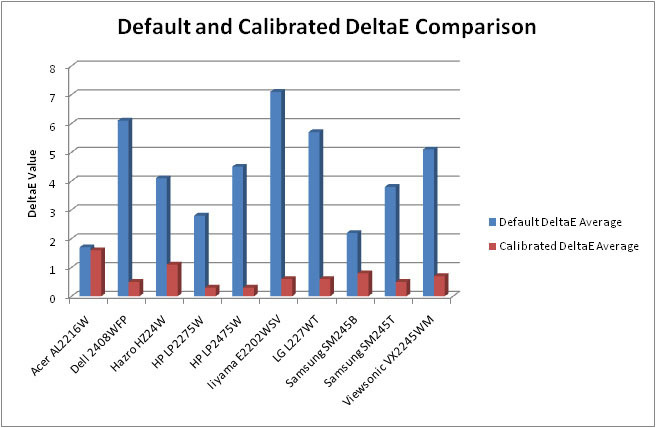 As you can see from the report, average dE was quite low for default settings, with a reading of 2.8 being recorded. Maximum dE was also quite low compared to other models, at a level of 5.4. The panel was reasonably well set up at default factory settings, and this is a good sign for anyone who doesn't have access to a hardware colorimeter. Overall, the default colour accuracy was quite impressive, but I would certainly recommend a change in the brightness control from 90 to around 50 - 70%. We tested the screen again after simply switching to the "custom color" mode in the OSD. This allows access to the RGB controls for calibration and moves the screen away from the preset 6500k mode. The screen felt a little more even in terms of colours, and the green tinge was eliminated on the most part. Luminance was increased further away from the desired setting to 261 cd/m2, and most noteably, the colour temperature moved further away from the desired 6500k, being recorded here at 7016k (8% deviation). Colour accuracy was a little worse as wel, with average dE now being 3.9, and a maximum dE being recorded at 11.1 in blue shades. 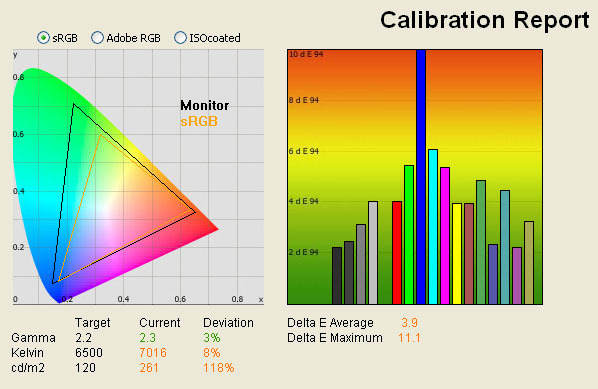 If you are going to want manual control over the RGB channels, you will need to make some adjustments to them, since the default 255 for each gives results which are inferior to the 6500k preset mode. The LP2275W offers a supposed sRGB emulation mode. This is something which a fair few extended gamut screens are offering as a preset, and are designed to help simulate the normal sRGB colour space. The option is available via the OSD and a preset mode. Like the LP2475W, this mode seems to do very little in reality. The gamut, as recorded on the CIE digram above, still stretches far outside of the sRGB colour space, colour accuracy and other readings are all very similar as well. This preset mode seems useless really. I calibrated the screen using the LaCie Blue Eye Pro device and software. The calibration produced very pleasing results. Gamma, colour temperature and luminance were all corrected very nicely, and were all nearly spot on. 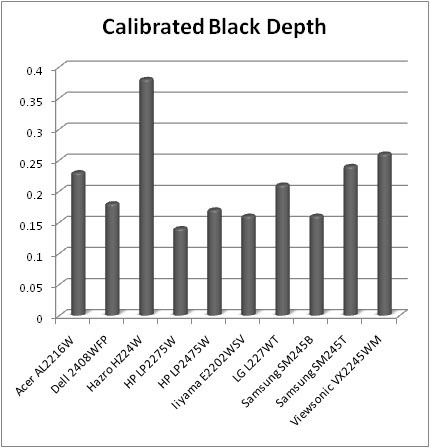 Black depth was now recorded at a very impressive 0.14 cd/m2, which was one of the best calibrated black depths we have seen in our reviews, and the best in any of our 22" + tests. This gave us a static contrast ratio of 857:1, again, very good. DeltaE was improved very nicely and was now only 0.3 on average. LaCie would consider colour fidelity to be excellent overall here. This was our joint best overall colour accuracy from any display we have tested, being equal to the HP LP2475W and Hazro HZ30W. The maximum dE was only 0.7 as well, being only slightly higher than our most accurate reference screen, the LP2475W with 0.5 max. One thing to note regarding the calibration process was that it was quite tricky to get the luminance of the screen to be right. I folowed the normal process, and the LaCie software seemed to indicate that a setting of around 30% was most stable (in the early stages of the calibration software). Allowing the automatic process to take place, the end results were good overall, but luminance was too low. It took me a few goes to get the luminance to be 120 cd/m2 as it seemed the software was giving me an inaccurate reading of the optimum brightness control level. I settled with 70% in the end, which gave me a 120 cd/m2 luminance as required. Subjectively, it was impossible to detect only the first 2 shades of grey on the scale from 0 - 255 (255 being pure white). I followed the useful tests here, where the first square you could distinguish on the LP2275W was number 3 (just). Testing the screen with various colour gradients showed smooth transitions both horizontally and vertically, and no real sign of gradation. There was certainly no banding issue here. If I compare the colour accuracy of the LP2275W with the other 22" monitors we have tested, and with some of the popular 24" models as well, we get the above results. As you can see, default dE average was very good on the LP2275W, and better than most of the other screens out of the box. It was not quite as good as the Acer AL2216W which offered very impressive default colour accuracy with average dE of 1.7. The Samsung SM245B (24") was also a little better at 2.2 average dE. Interestingly, both those models are TN Film based, a technology traditionally linked with poor colour qualities! Obviously there have been some big improvements in this area in recent years. It should be noted that after calibration, neither of these TN Film based models achieve the excellent colour accuracy that the LP2275W (or others here) can offer. As I've said above, the calibrated dE average of 0.3 is the joint best we have seen in our reviews to date. If I compare the calibrated black depth of the same screens (where luminance has been calibrated to 120 cd/m2) we get the above results. The LP2275W is actually the best 22"+ sized screen we have tested in this regard (0.14), beating the best IPS based models (HP LP2475W - 0.17) and the best TN Film models (Iiyama E2202WSV and Samsung SM245B - 0.16). Another impressive result from the HP 22 incher. Viewing angles of the LP2275W were very good, and clearly a step above those of the TN Film models which dominate this sector. The angles of vision were wide in each direction, and free from the obvious contrast and colour tone shifts that you see from TN Film models, particularly vertically. There was no sign of the characteristic darkening of the image from below that you see on TN Film panels. As you moved your line if sight to quite extreme angles, there was a slight shift towards yellow. This was perhaps a little more apparent vertically than it was horizontally, but in normal use, you'd be hard pressed to spot it. Interestingly, the VA contrast shift which you normally see as you move away from a central point was improved on this model I felt, and not as obvious as I have seen on some other S-PVA based screens. Looks like Samsung have made some improvements with their more recent generation of panels. Overall, viewing angles of the LP2275W were superior to the majority of other 22" models due to the use of S-PVA. There are currently no 22" IPS based matrices, which can offer slightly wider viewing angles than VA panels in other screen sizes. The above analysis shows the overall uniformity of the screen was not particularly great. There was a gradual, and rather obvious in these tests, difference in the brightness of the screen as you moved diagonally from top right, to bottom left. The luminance varied from the target level of 120 cd/m2, up to about 141 cd/m2 in the top right hand quadrant (+15% variance), and down to about 96 cd/m2 in the lower left hand corner (-25% variance). This difference was quite considerable, and a little disappointing. In practice, it was not really possible to detect any obvious variation in luminance across the screen, even examining several white, grey and dark background colours. As usual, I tested the screen in a darkened room, showing an all black background. The above image was captured by my camera. There was no noticeable backlight leakage from any of the four corners, or along any edge. This was an impressive result since a small amount of bleed is normal on most screens. Thankfully this means you won't have to put up with any dodgy backlight leakage along black borders in movies, where that type of issue is particularly apparent. While the luminance uniformity was quite poor overall (as shown above, there was no obvious backlight leakage from the screen). For office use, the LP2275W offered a fairly pleasing option. You will probably want to calibrate the screen down to a comfortable luminance, or at least change the brightness control somewhat. Once that is done, you end up with a screen which feels comfortable for prolonged use in Office applications. There was no monitor preset mode for "text" or "internet", and so you will need to adjust settings of your main configuration, rather than being able to switch between different modes. The pixel pitch of 0.282mm is common for 22" models was comfortable to use, and made text a little larger than 20" and 24" models with their standard resolutions. This might prove a bit better for some users who prefer slightly larger text which is easier on the eye. The native resoluion of 1680 x 1050 is nice for office work and affords you a decent amount of desktop real-estate to work with. It's not quite as good as the 1920 x 1200 resolution of 23-24" sized screens, which I prefer for side by side split screen working personally. The screen only had a digital DVI interface, and no analogue D-sub connection. As such, I was unable to compare the picture quality between the two. The DVI offered a nice crisp and sharp image which is important for office applications. Wide viewing angles and deep black depth from S-PVA technology, will help ensure this is a suitable screen for colour / photo work as well, free from the obvious contrast and colour shifts of the main 22" TN Film market. The HP LP2275W was tested using the chase test in PixPerAn, a good bit of software for trying to quantify differences in real terms responsiveness between monitors. As a reminder, a series of pictures are taken on the highest shutter speed and compared. The images below show the best case example on the left hand side, and the worst case example on the right hand side. This should only be used as a rough guide to comparative responsiveness but is handy as a way of keeping a constant test of each screen. The LP2275W uses an S-PVA technology panel from Samsung (LTM220M3), using Response Time Compensation (RTC / Overdrive) technology to boost response times. This is done by taking a regular S-PVA panel which is traditionally capable of having a mimimum response time at the ISO black > white > black transition. This is where the ISO 16ms number comes from in the quoted spec, and was traditionally the limit of the speed of any transition for S-PVA panels. This always used to be the fastest transition since the highest voltage was applied to the crystals to rotate them from being fully open (white) to fully closed (black). The largest distance between any two points warranted the highest voltage in order to make it happen. Grey to grey tranisitions in the intermediate stages were always traditionally much slower as a smaller voltage was applied, since there was less change to make. With the arrival of RTC technologies, Samsung have now applied an 'overdriven' voltage to all grey to grey (G2G) transitions, boosting the response time considerably. G2G changes are now the fastest, hence the newly quoted 6ms G2G figure. In practice, this can also make a marked improvement to responsiveness. We have already touched on the fact that the LP2275W is one of the few screens in the 22" market which doesnt not use TN Film technology. There are a couple of other screens from Eizo and Lenovo which are also S-PVA based, but the market is dominated by cheaper-to-manufacturer, TN Film models. The TN Film models are a mixture of non-RTC screens (spot the 5ms response times) and RTC-enabled screens (spot the 2ms G2G figures). We have tested both here at TFT Central, so should be able to make a good comparison between the three. The above images from PixPerAn show the performance of each. You can easily spot the improvements that the overdriven models offer, as compared with the non-RTC Acer AL2216W model. The HP LP2275W remains a little behind the fastest overdriven TN Film models in the 22" market (the LG L227WT is the reference here), and you can spot a more obvious trailing image, even in the best case. The LG L227WT shows a pale halo behind the moving car, which is a result of 'overshoot' of the RTC impulse. This 'inverse ghosting' is a result of a poorly configured and controlled RTC and can cause issues on some screens where the technology is used aggressively. The LP2275W doesn't shown any pale halos, but the moving car does look a little more blurred than the faster models we have tested. It is a step above the 5ms TN Film generation though, so a pleasing result in this test overall. As a reference, I've provided the results of the LP2275W next to it's 24" brother, the LP2475W and our reference LCD screen, the NEC 20WGX2. The performance of the S-PVA LP2275W is perhaps a little behind the heavily overdriven H-IPS panel of the LP2475W, but is free from the slight dark trailing that we experienced with moving images, and evident in the photos above. The NEC 20WGX2, featuring a 6ms G2G AS-IPS panel, is still regarded as one of the fastest TFT screens on the market, and shows a more responsive image in the tests above. The screen thankfully features a wide range of hardware level aspect ratio control, accessible via the OSD menu. 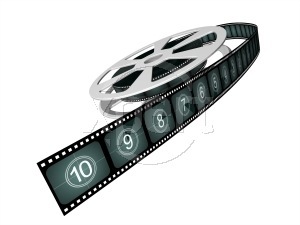 There were options for "fill to screen", "fill to aspect ratio" and "one to one". I tested all of these using various gaming resolutions and they seemed to work nicely without issue. These options are particularly useful when connecting external devices which need to run at resolutions outside of the native 1680 x 1050 res, or indeed outside of the standard 16:10 format of the screen. As you can see from the above graph, the LP2275W performed quite well in this test. It was pretty much identical to the larger 24" LP2475W in this regard, with an average input lag of 25ms, and a maximum of only 40ms. Apart from the 24" LP2475W, Ive compared the LP2275W with various other popular 22" models we have tested here (top half), or have been tested elsewhere (second half - credit to DigitalVersus mostly). Overall, the level of input lag was pretty average for this sector, being not as fast as some popular TN Film models like the Samsung SM226BW and Iiyama E2201W. In practice, I doubt this level of input lag would prove an issue to many users. 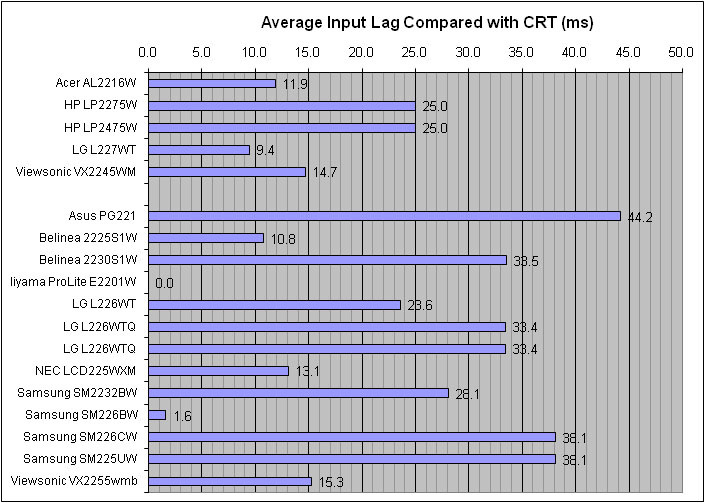 The similar performance to the 24" LP2475W is probably related to the use of very similar (same?) scaling chips and electronics in both. Overall HP have managed to produce another impressive display offering. It might be a little more expensive than some of the competiton in this sector, with a retail price of around £275 GBP, but it really does offer some features which separate it from its rivals. It's one of the few non-TN Film panels in this sector, and that immediately puts it in its own niche market. The use of this technology has allowed HP to offer a 22" screen which really can offer some great all round performance. Colour accuracy, contrast and black depth are all excellent, especially once calibrated, but are even pretty respectable at default settings. Responsiveness and input lag are pretty good, and the screen offers versatile performance for gaming, office and movies. While there appears to be a few minor build quality issues, presumably a sacrifice of keeping costs down, there is a decent range of ergonomic adjustments and features which give the LP2275W a premium feel. It's a very good all round screen, and if you are looking for something at the top end of the 22" market, this would be a great choice.